Focus:Energy and infrastructure management solutions that inspire intelligent use of data center resources, including energy, equipment, space and people. 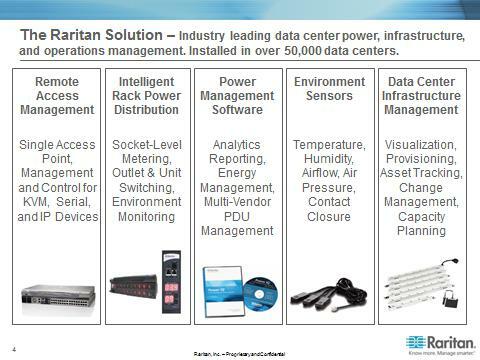 Technologies:Smart rack iPDUs and Sensors, Energy Management Software, DCIM software, secure remote access and control. Register your Raritan deal over $10K MSRP for 10% off MSRP. Trade in your existing equipment and migrate to our next generation KVM-over-IP, serial-over-IP and centralized management solutions.